For this blog I would like to show a rare version of the song “We’ll keep a welcome” sung by Dame Shirley Bassey, Bryn Terfel and Michael Ball. I found this clip on a videotape of our dear late friend Jean and her sister Audrey made it available for the blog for all fans to enjoy. At the beginning of the clip it takes a few bars before their voices blend in but after that it is pure magic. Also a few newspaper articles about the opening of the event. I hope you enjoy it and it is with special thanks to you Audrey. Music by Mai Jones. Lyrics by Lyn Joshua and James Harper. Released in 1999 on the various artists album Land Of My Fathers together with The Black Mountain Male Chorus and the Buy As You View Cory Band. 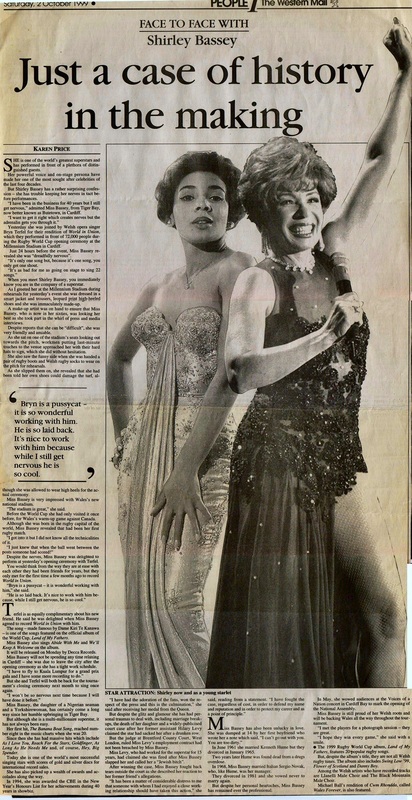 Shirley Bassey already performed the song in 1986 on Des O’Connor’s Christmas Show with Des and Tom Jones. 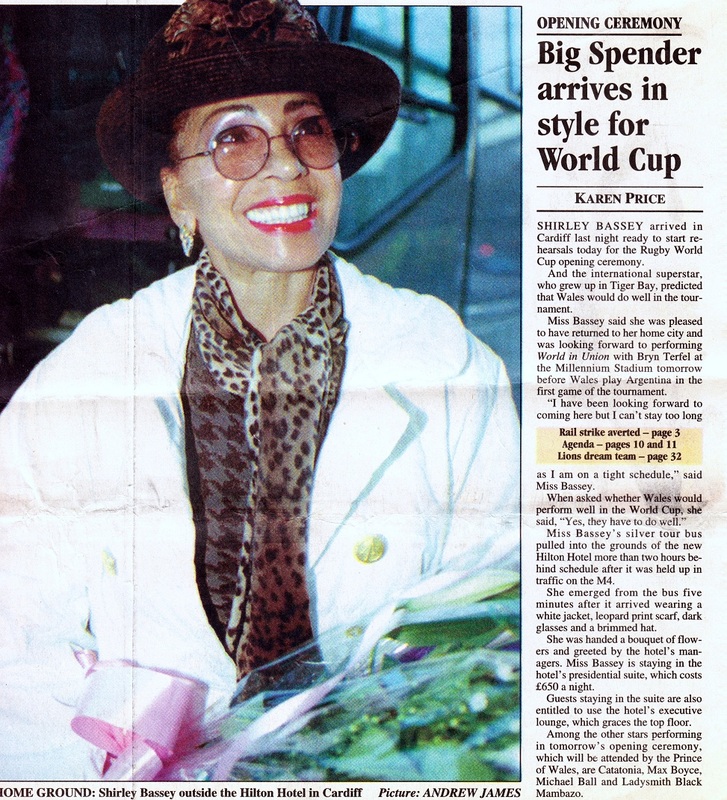 She performed it again with Bryn Terfel and Michael Ball during the Rugby World Cup 1999 closing ceremony (November 6th) before the final game. Unlike World In Union this song was performed live in front of thousands in the stadium and on the TV screens. Wales is known world-wide as being “The Land Of Song”, and this famous Welsh song (Jones, Joshua, Harper) epitomises Wales as a country which will always be singing and which will always be welcoming. The word hiraeth is used in the third verse – a word which is almost impossible to translate, but is frequently used in Welsh as a means of describing the longing that one would feel when away from Wales for any length of time. The song was originally published in Cardiff in 1943. It became famous after singer and actor Harry Secombe performed it on his TV programme Highway. Dame Shirley and Bryn being interviewed for Welsh TV. Thank you Pieter and thank you Audrey for this beautiful video clip. Three great singers singing this anthem superbly. I enjoyed the articles very much.